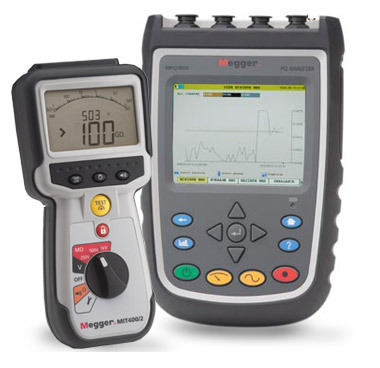 Norristown, Pa. April 2017 – Megger now offers a handheld, 3-phase power quality analyzer that makes power quality analysis easier and more efficient. The MPQ1000 is Class A and is rated CATIV at 600V. It can be used for a wide variety of applications including substation monitoring, equipment and breaker tripping, load studies and load balancing as well as for switchgear and component failure. signaling, phase angle deviation, as well as performs waveform analysis to the 128th harmonic in real time. Data gathered during testing can be recorded with the MPQ1000 record verification by simply pushing a button. This feature automatically detects the current clamps, recognizes its range, identifies the nominal voltage and sets the triggers, as well as verifies that the unit is connected properly to what it is testing. The MPQ1000 features on board data analysis. An SD card is used to expand memory and all data recorded can be viewed on the unit’s color VGA display, or can be transferred to Megger’s power quality analysis software via USB cable, USB stick, Ethernet or directly from the SD card. The free PC software that comes with the analyzer provides unparalleled capabilities. It automatically creates custom configurations based on the customer problem and performs custom automatic data analysis. It also allows the user to create their own analysis templates that can be loaded into the analyzer. The MPQ1000 unit also features flexible current clamps that have four selectable ranges from 0 to 6000A.